With my years of experience I am the ideal catering partner as I have seen and done hundreds of weddings both abroad and in UK. From a traditional 4 course seated menu to buffets, tapas, barbeques and beyond I offer a bespoke service to bring you an individual twist. We work together with your initial ideas and develop a meal that both excites you and thrills the guests. I provide a professional service team to ensure the day runs smoothly and every guest is looked after to the best possible standard. 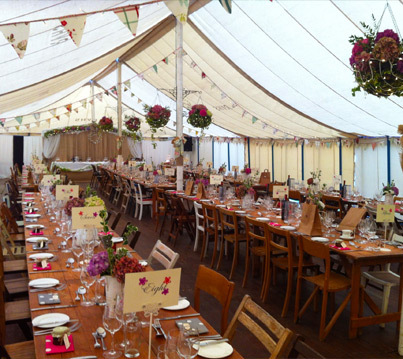 I can cater in any venue and would work with you to arrange marquees, venue dressing, and all other aspects of the event you would like if required. Simon is one of the best chefs you can find! Totally professional, super good fun, approachable. Superlative work ethic. He has made me look fabulous with my wedding clients lots of times. His team is also amazing. His food, beautifully presented, even to suit the theme, a taste sensation and served immaculately. I just wanted to email you to say a HUGE THANK YOU to you and Alison for your exquisite food and great company this weekend. Everyone was still talking about it when we left yesterday and again this morning on Facebook! Your patience with us as the day got pushed back and the fun you injected into the afternoon tea and dinner was just brilliant and much appreciated. I couldn't have hoped for it to go more smoothly and that is totally down to you and Alison, so thank you both. You really took the pressure off me and allowed me to enjoy the event too, which I was very grateful for. Emma (the bride) has described the weekend as 'one of the best weekends of her life' and that's all I could have hoped for.